A few years back Food & Wine did a piece on Andy Ricker's Pok Pok calling it one of America's best Thai restaurants. How could I not check that out? Turns out even though it's not the new kid in town any more, you still can't get a table, so even on a Sunday night we were faced with a 2.5 hour wait. Bananas right? The restaurants was technically supposed to close in less than 2.5 hours, so this did not bode well for us. Fortunately Pok Pok's sister restaurant, Whiskey Soda Lounge, is just across the street and shares some of the same menu items minus the monster crowds. 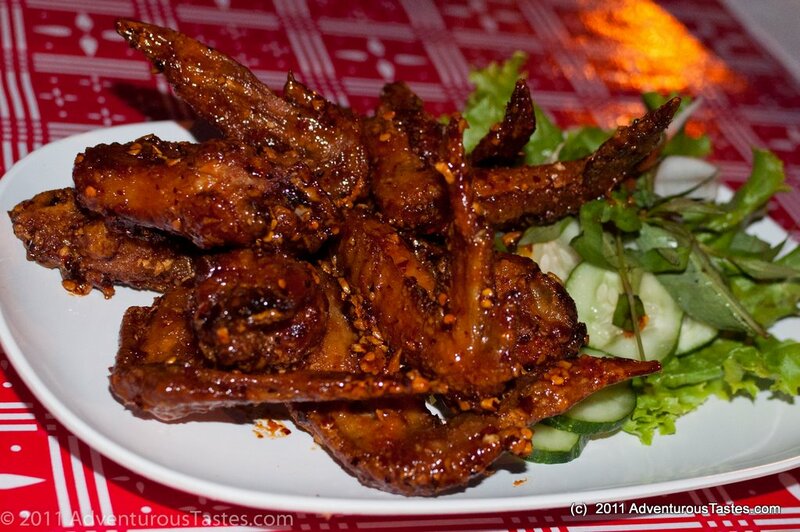 Not to be missed are Ike's Vietnamese Fish Sauce Wings. These pungent little babies pack some serious flavor. Sticky, salty and sweet, these aren't your daddy's buffalo wings! I washed down all that fish saucy goodness with one of their famed drinking vinegar cocktails, the Apple Gin Rickey. According to their website, drinking vinegar have been around for ages and were in the past enjoyed for their medicinal benefits. 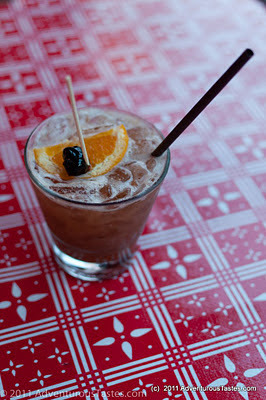 Today they just make for a damn fine cocktail, with the tartness of the vinegar cutting the sweetness of the apple. You can buy your own here. We were tempted to try jelly beer, which is apparently a super cold beer slushy, but ultimately decided it sounded cooler than it was likely to taste. Right about when I started getting full of wings, we actually got a table back at Pok Pok. I wasn't going to let a little thing like having a full meal keep me from trying the restaurant I came for! Maybe I was just tired and a little too full to still be eating, but nothing else quite lived up to the glory of the wings. 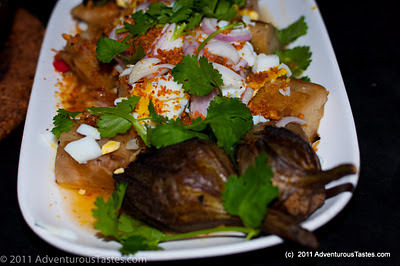 The eggplant salad was quite different with a smokiness uncommon in American cooking but after a while it was too much of a good thing. They were out of the Kai Yaang, rotisserie game hen, which I'd heard was a must-try, so that was dismaying, but at 10:30 on a Sunday I was lucky I was getting anything. We tried a meat dish, too, but to be honest, I can't even remember what it was. Not that memorable I suppose! Oh well, I guess I'll just had to head westward on an empty stomach again sometime so I can get the true Pok Pok experience. Until then, I'm excited to make some fish sauce wings at home - yum! Turns out vinegar drinks are making a comeback - read more about it here. Now I'm thirsty!